8.5 oz cylinder bottle designed for one-hand operation. 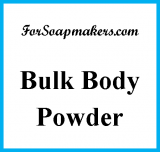 Suitable for bathroom or kitchen areas. CLEAR PET bottle, black or white pump with clear overcap. 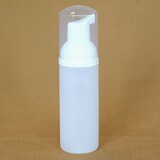 Non-Aerosol foam pump bottles in the larger 8.5 oz (250 ml) size. Suitable for bathroom or kitchen areas. Clear PET bottle with either white or black pump and clear overcap. Colored product shows through the bottle. Bottle, including pump and overcap, is about 8 1/2" tall and 1 7/8" in diameter. It uses the same pump as the natural 7.5 oz bottles, but there is a longer straw on the pump. For complete details on use of the foam pump bottles, including tips and tricks and recipes see Foam Pump - Use and Directions.